A different type of frostbiting has been taking place at Pequot Yacht Club (PYC) in Southport, CT. PYC member Charlie Reynolds recognized the skill of the junior sailors at the club and their willingness to continue sailing into the off-season – long after the junior sailing awards had been handed out and school back in session. Since October, juniors have been taking to the water to sail their Optimists, hone their skills, and hang out with some of their friends. More than a dozen sailors have enjoyed several weeks of competition and camaraderie by racing their Optis for an hour before the club’s Dyer fleet launches, where the adults spar off in two separate divisions. The group has been blessed with perfect fall weather conditions, sailing between three and five races per week. There’s even a group of spectators cheering them on. Some of these young sailors have chosen to continue their time on the water, trading their Opti for a Dyer and competing against the adults in the morning racing session. “We actually do pretty well sometimes,” said Cam Nash, from PYC. 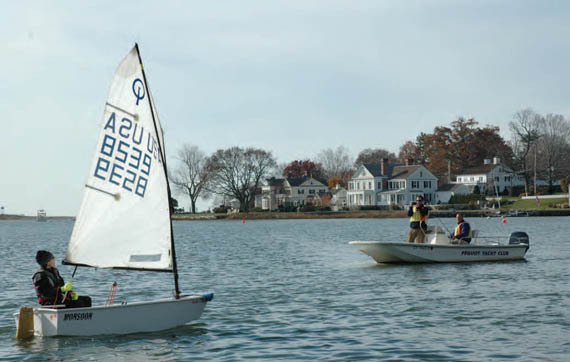 “One weekend, three junior sailors held the 1, 2, and 3 positions on the score sheet,” noted Patrick Nolan, from Fairfield, CT. “We are pretty fast in light air because we are smaller and lighter than the adults, so they just can’t keep up,” Nash continued. It’s clear these kids were eager to talk about their experience and are having a blast and learning a lot in the process. With this additional time on the water, training against adults and staying sharp with the rules, these kids are going to be hard to beat come summer. “It’s better than going to church and hey, we want our kids to have the advantage come spring,” laughed Greg Berg, who along with other dedicated members Reynolds, John Wilcox, Dan Nash and Jonathan Thompson, have spent each Sunday enjoying their time working with the young sailors. After the day’s racing, sailors and parents can stick around for an off-the-water debrief that includes video analysis of starts, sail trim, rules and pointers from the club’s adult supervisors. And, the sailing is not reserved only for PYC members’ children. “The racing is invitational, open to other area clubs,” Thompson said. “We’d love it if more kids came out to experience this.” Cedar Point Yacht Club was represented by three sailors the dayWindCheck visited, and Black Rock Yacht Club sailors were expected the week following. Weather permitting, PYC will host Opti racing as far into this month as possible and pick back up in the spring. “We hope to run these races as long as we can before the cold weather really kicks in,” Thompson noted. 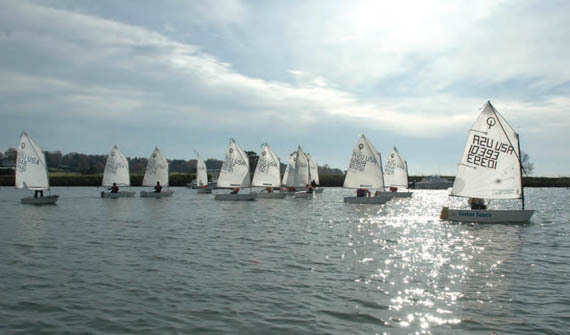 “Even though Mother Nature has been kind and the water is still relatively warm, there are strict rules involved with juniors sailing in the frostbite series, however. This is not a drop off program – parents must remain at the club to watch, and many assist by running races or providing instruction,” he continued. “Two safety boats are on the water at all times. If someone capsizes, all boats return to the safety of the dock until the boat in need of assistance is righted and safe.” Appropriate clothing is a must and sailing is only held in conditions that are manageable. These are certainly simple rules worth following because the experience for the kids is invaluable, the competition is great, the fellow parents are friendly and weekday mass is always an option.